Some AARs from campaigners. If I missed you, post a link in the comments! The Battle of Bayeux was resolved through 15 games. The final results saw the Allies with a sizable 56-45 lead in victory points. 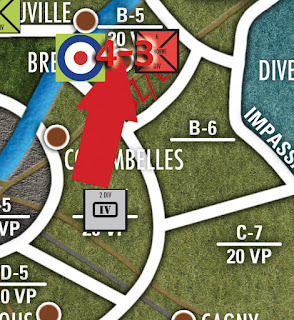 The Allies captured Bayeux and exploited the Caumont Gap to capture B-1 and launch an attack at Villers Bocage. The top axis general was Morgan and the top Allied general was Adam P (sorry for the mix up previously). 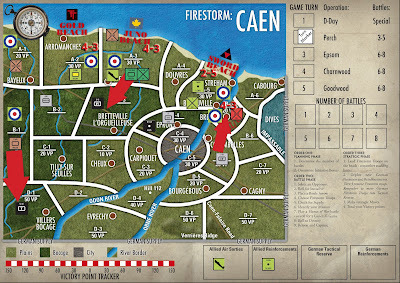 The attack of the 21st Panzer Division at Sword Beach was resolved through 10 games. 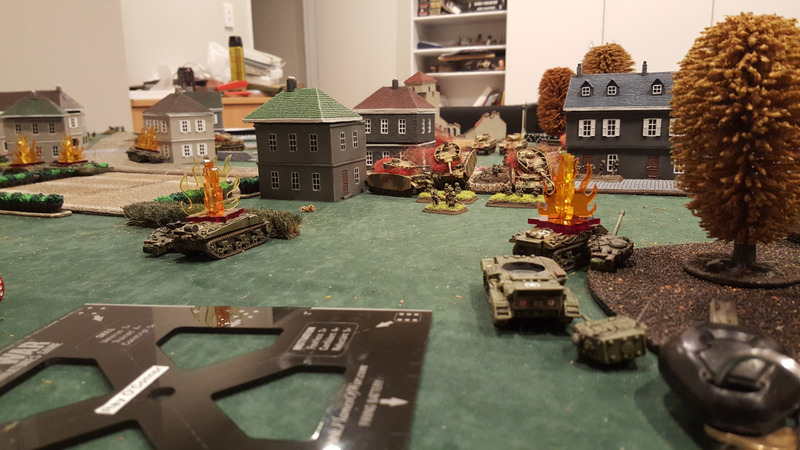 The Allied forces successfully held off the Axis attackers with a 38-32 lead in victory points. The top Allied generals were Lachlan, Glen, and Jim. The top Axis general was actually myself (in a traitorous turn of events). Turn 2 also featured a mini tournament day at Drexoll Games in Vancouver, Canada. Some of their pictures are featured here. 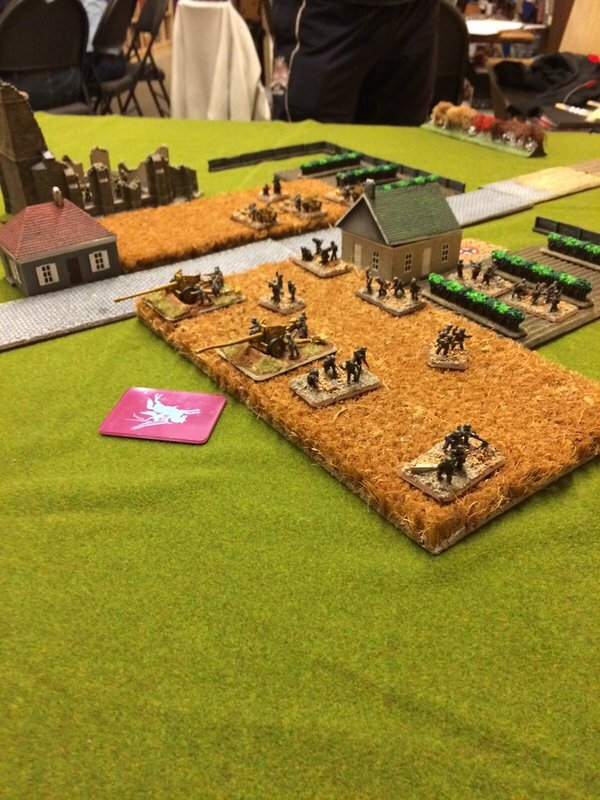 If you have a multi game event, send me an email and I can have a set of games tied to the campaign for you. Allied forces on Juno Beach have been successfully landing for days. 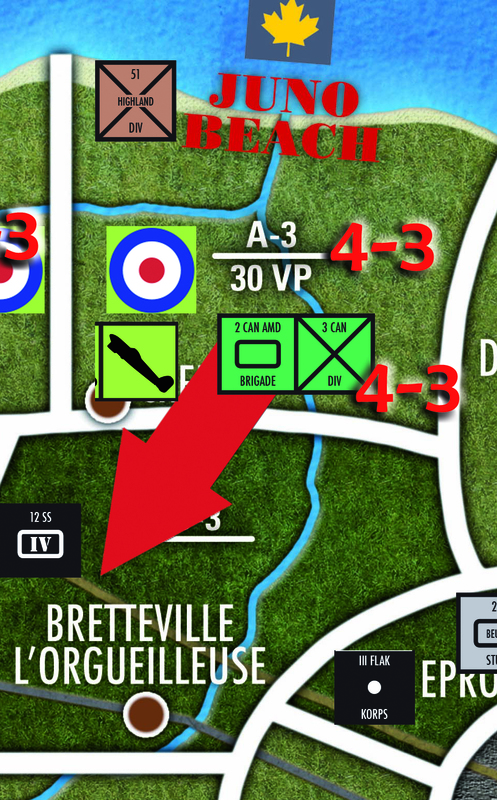 As reinforcements pour in, the Allies launch an offensive into Bretteville L'orgueilleuse (B-3). The Canadian forces tasked for this mission are eager to prove they are the equal of any Commonwealth troops. 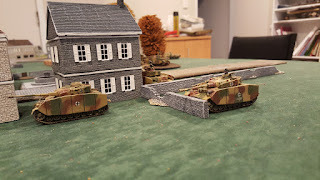 In their way, the 12th SS Panzer Division has deployed a company of Panzer IVs. 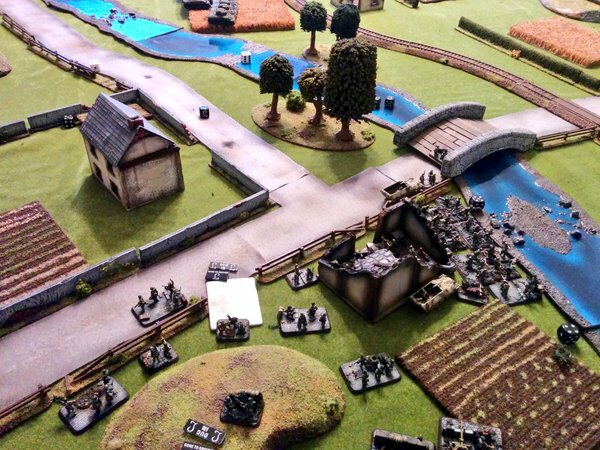 The Allies must contest with stiff German resistance and the natural fortifications of the dense bocage hedgerows. Can the Germans hold their objectives long enough to thwart the Allied attack? *Note-This matchup is pretty tough for the Germans. Make sure both players are okay playing with the unbalanced troops. You can modify the FS troops to create equal forces if you prefer. 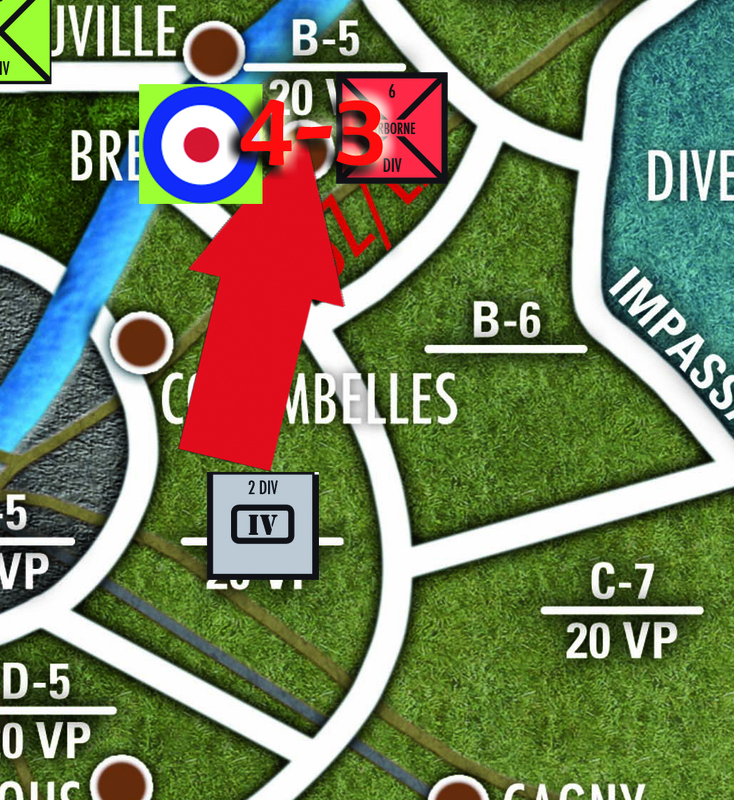 After consolidating their forces after D-Day, the beleaguered British airborne troops at Breville face a swift counterattack from the battle hardened 2nd Panzer Division. 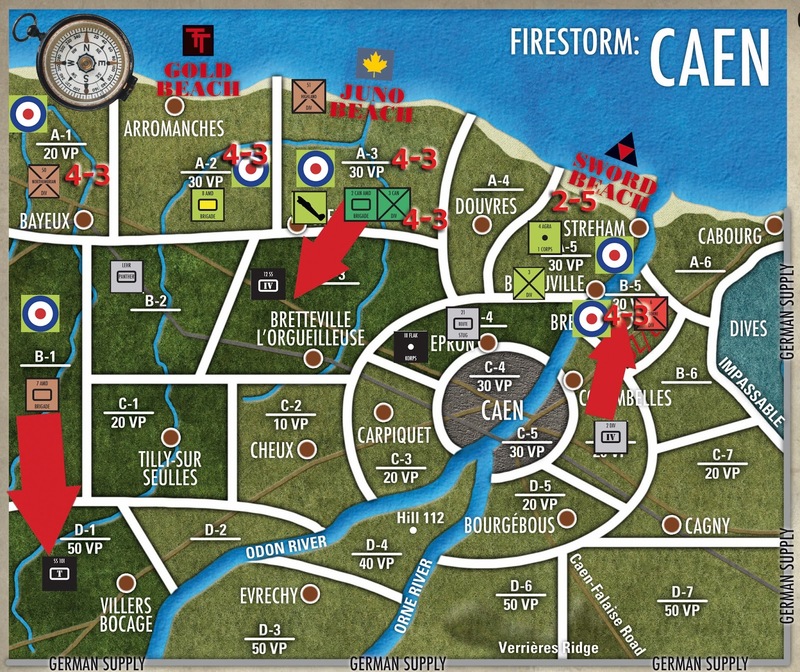 Allied troops hold the shortest route to capturing Caen at Breville but lack the heavy support needed for facing veteran German panzers. These crack German troops are refitted after a long campaign on the Eastern Front. 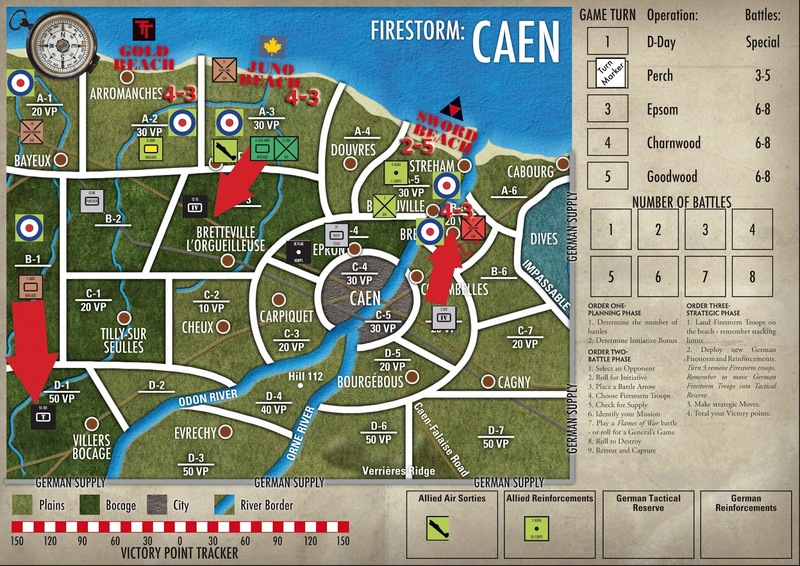 Can the British troops hold their ground and protect the fragile Allied Northern flank? Remember to send your results in the following format. Location is the campaign location! Just out of curiousity, do most of you players stick with a single army game after game, or do you switch things up from time to time? I've got piles of German Grenadiers, and loads of Panzer IVs, StuGs and Panthers, so I can field infantry And armored companies. Do you change your list type depending on what 'divisions' are involved? Or do you stick with what you know and love, and just add in the firestorm troops as nearby allies and units seconded to your command? Usually I bring forces for both sides as we never know who will show up for game night. Often I bring enough troops to vary the lists so don't just use one fixed force for all battles. I usually stick with a force for several months, only changing it slightly. I paint so slowly and I get attached the my most recently painted platoons. 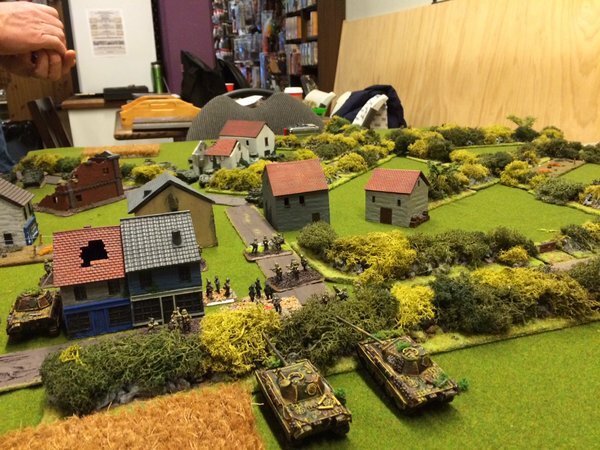 For the campaign I've been playing panzergrenadiers but may pkah allies if needed for a night in our local group. 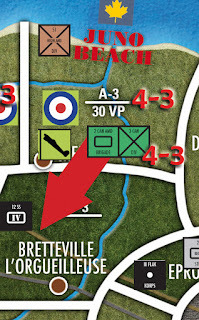 I used Airborne Armoured Recce in turn 1, Guards Armoured in 2a and next battle is Breville so likely some other variation of my Paras, might take Commandos as support for a lol. I use my Polish 1st armoured (yes, they are a month early...) all the time - finally finished painting them, and as someone else pointed out - one does get attached to the platoons after a while... but I do make some small adjustments from time to time. The biggest problem in the list is the lack of infantry, and my opponent is a hell of a player with lots of veteran infantry with Stugs and Pak40's. 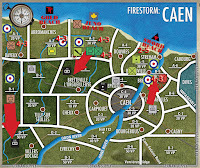 http://1059thcadian.blogspot.com/2015/12/flames-of-war-battle-for-caen-continues.html A week late, but I finished my write-up, haha. This comment got caught in the spam filter. It's up now!